Gorjanci are karstic hills and the most eastern dinarides in Slovenia their chain ranging from South-West to North-East, which differentiates them from the general ridge of the Dinaric hills ranging from North-West to South-East. The ridge represents also the state border between Slovenia and Croatia. The hills on the Croatian side are called Samoborsko gorstvo. 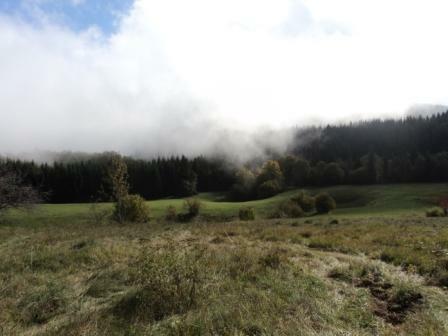 The highest point is Trdinov Vrh with an altitude of 1178m. Gorjanci were already very high in the Tertiary area. The mountains’ slides are mostly covered in beech trees and also spruces, planted for its fast growth and forestation. 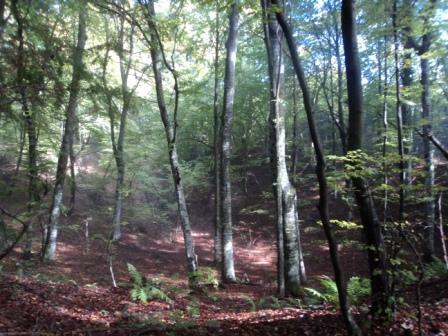 On lower altitudes, we can also find a greater number of ash and chestnuts trees. Sinkholes and chasms are very frequent on the plateau. The hills hide many water sources, the most famous of which are Minutnik, Kobila, Pendirjevka, Sušica, etc. The last serves also as a boundary line for the Municipality of Kostanjevica and got the name for its intermittent characteristics. Gorjanci are also home to various species of birds, game, dormouse, wild boars, foxes, wildcats, martens and occasionally bears. Gorjanci held a high recreational importance since there’s plenty of paths that make them a perfect place for hiking. The most famous mountain huts are Gospodična and Miklavž below the peak Trdinov vrh. Janez Trdina described the varied folk tradition and combined it in his work Bajke in povesti o Gorjancih. The highest part of Gorjanci, near to Kostanjevica, is Opatova gora with an altitude of 900m and a shrine Mirčev križ, accessible with a macadam path. In the past, people used to transport wood with a waggon and a horse yoke for work. The legend of the fairies Čestitke narrates about 3 good fairies that lived on the hills Gorjanci and helped the locals with farming. The fairies didn’t want the people to see them. One day, they were bathing neat the stream and their fairy voices attracted a young man, who forgot that he shouldn’t disturb the fairies. The fairies saw him, threw him into the river, so the farmers found him a few days later lying dead in the steam. They knew he angered the fairies and because of that the fairies stopped caring for the weather and the harvest, there were floods and fires. This lasted until the day a monk came by and promised the locals that everything would go back to normal, if they would help him build a church. The locals helped him build the church, but every night the fairies destroyed what was built during the day. This continued to happen until they managed to finish building the church and the bells finally rang. When the fairies realized that the people would succeed in building the church, they started preparing for leaving the land. The first fairy started making bread, so they wouldn’t be hungry, the second started sweeping the floor in case they’d get back and the third, the most beautiful one, started combing her hair, so she’d look beautiful for the road. The moment the bells rang, the fairies on the hills Gorjanci turned into stone, where they still remain today.